I have a form that has Email Alerts enabled but I am not getting the emails when I click the Test button (or when the form is submitted). I created a new notification for the form and tried sending it to a different email address (a gmail account) but when I click the test button it still says that the form is being sent to the email associated with my account but I don't get the email at that address either. I have sent another test, please let me know if you are able to receive the email notification through katma*****@gmail.com. Mail Logs says it has been sent though. 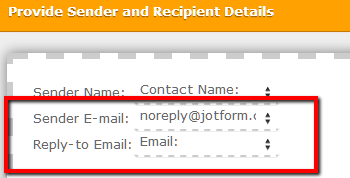 If the issue still persists, please try to set the notifications Sender Email to noreply@jotform.com just like in the screenshot below and see if that makes any difference. You seems to be using the Postini mail service on the @l*******.edu domain. Can you please try to add the following addresses via "Postini Approve Senders" feature to see if that makes any difference? You may ask your email administrators for this. 1. Test Email button is sending the test message to the account email only. 2. Your second email alert is created as Autoresponder. It is sending emails to the form fillers from @gmail to their @email. Email notification is different from Autoresponder.